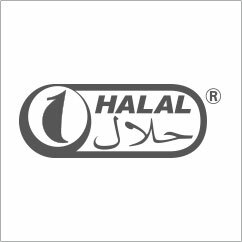 Halal certification is a quality assurance process applied to food products and services according to the Halal regulations. This certificate ensures that our products are safe for consumption and use by the Muslim community. This certification, which is granted by the Halal Institute, ensures that products do not include in their composition anything that is considered illegal by Islamic law, and that they are prepared, processed, transported and stored using means that are exempted from any item prohibited by the law. It also guarantees that the products have not been in direct contact with other foods that do not meet these requirements.